A video projector that is the size of a sugar cube has been created by researchers. 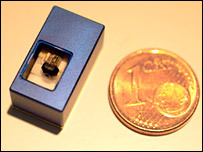 The miniature device could be used to project images from mobile phones, PDAs or laptops, according to the team. It was created by researchers at the Fraunhofer Institute in Germany. Traditional projectors use arrays of millions of mirrors to display footage, but this petite prototype comprises a single tiny mirror. The width of the projector measures less than 16mm; its height and depth is 9mm. Inside, a laser is fired at a tiny vibrating mirror, which deflects the beam to produce the pixels that form the final image. Presently, the projector can only work with red and blue lasers, meaning any displays have a limited colour range. Green diode lasers are not yet small enough to allow the device the full range of colours. But the researchers said once laser technology has moved forward, their projector will offer a smaller, lighter and cheaper alternative to the classic system. Dr Peter Schreiber, of the Fraunhofer Institute for Applied Optics and Precision Engineering in Jena, said: "I think there are a lot of useful applications for such as device. "First of all, it is very tiny, so it could be used as a projector for a mobile phone, or a projector for a laptop." He added that unlike standard imaging devices, the device could project images onto curved surfaces, such as a dome, which might give it some niche applications. Other laser-based video projectors have been created, but have been limited to the size of a matchbox.